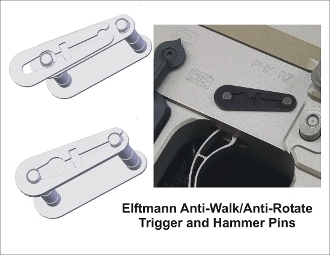 The ELF anti walk pins are so easy to install, it takes just seconds to protect your AR-15 or irreplaceable M-16 receiver. Installs by simply clipping master link over protective plate. Strongest AR-15 / AR-10 / M-16 pins available. The pins are made of hardened American steel and will easily withstand the impact of high powered semi and full auto weapons. The anti rotation feature will protect your receiver from wear. Side plates will protect your finish. They can be installed from either side and either direction. Finish is black oxide. No special tools required for installation or removal.